Weight Distribution Hitches are an optional add-on system that help distribute weight, effectively reducing the amount of weight sitting at the tongue of your trailer and ballmount of your hitch. If when you're towing, you feel the front end of your vehicle and backend of your trailer are standing higher than they should, that's one sign that you should consider a weight distribution hitch system. 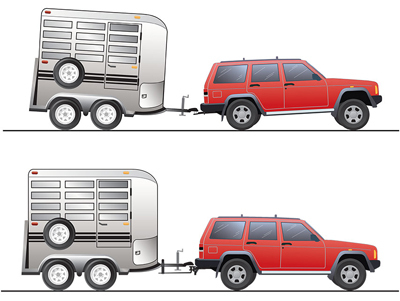 You will not only notice less sway when towing, easier handling, easier braking, but you'll also increase your towing capacity since the weight will be more evenly distributed and sitting on the trailer axles, really where the weight should be. Also, you will make it easier on your vehicle, and likely save on fuel. To choose the right weight distribution hitch, we have a variety of styles such as round bar, square bar, trunnion, with or without built in sway control, and a selection of tongue weight capacities plus a choice of different brands to suite your budget. Choosing the right weight distribution hitch shouldn't be difficult, below you'll find some helpful resources that will get you started, if you're still not sure, contact us and we'll walk you through your options. Lastly, worth noting that we ship all weight distribution hitch in Canada from Canada, so you don't have to worry about brokerage or duties, and we also ship free to your doorstep! HOW TO CHOOSE THE RIGHT WEIGHT DISTRIBUTION HITCH?